The international experts conducted the monitoring of the Tempus project, which has been realized at Altai State University together with foreign partners. On 28 June 2016 the Tempus project underwent the monitoring procedure carried out by the international experts at Tomsk State University. 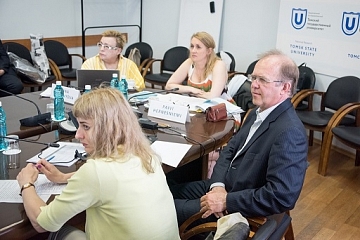 Altai State University established the UNICO Tempus Language Center in the framework of 544283-TEMPUS-1-2013-1-ES-TEMPUS-JPHES project aimed at creating a network of university language centers for people’s professional and personal development. The center has been successfully working since. The estimation of the center’s work was conducted by coordinator of Education, Audiovisual and Culture Executive Agency (Belgium) Paivi Hernesniemi and deputy director of the Erasmus+ (Tempus) National Office in Russia Anna Muravyova. The project received positive evaluations. Tempus JPHES is one of the European Union programs oriented to encourage carrying out of social and economic reforms and development of higher education systems in European Union partner-countries. The program’s general goal is to promote the cooperation in the sphere of higher education between European Union and its partner-countries in the framework of the Lisbon Strategy and the Bologna Process.